Inspired by conversations on the FOOD52 Hotline, we're sharing tips and tricks that make navigating all of our kitchens easier and more fun. Today, we’re talking enamel. And lucky for you, you can get the pretty pastel pots shown below by going here! Pots and pans are essential. They’re the building blocks of our kitchens, and of the food we cook in them. They help us through our most ingredient-heavy ragus and our simplest scrambled eggs alike. But not all pots are created equal. Some are better for making stocks, some for rouxs. Some are cast iron, some are enameled. Today, we’re demystifying the latter. What Exactly is Enamel, Anyway? Here’s the bare science of it: what you see coating common enamel pots is known as vitreous enamel, which is made by fusing melted glass particles to metal at high temperatures. What matters in the kitchen is the resulting coating -- glassy and smooth and sometimes pastel -- which acts much like a tablecloth does: it protects what is underneath it (in this case, your pot), and more often than not, makes it prettier than it was before. Enamel shrouds the underlying steel, preventing it from altering the flavor of your food. It’s also a great heat conductor, and the colors added during the enameling process are easy on the eye. Who doesn’t love a pot that you can match to your kitchen? 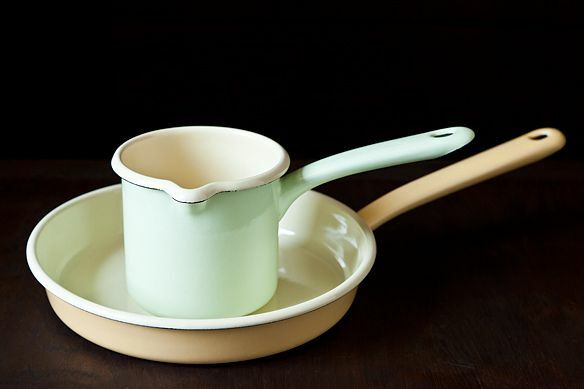 There aren’t a whole lot of rules when it comes to cooking in enamel, so mostly, you can stir and simmer away at will. It’s important to remember, though, that enamel is a bit too delicate for fast flashes of high heat. If you’d rather your pot live a long, healthy life, leave your intense searing for another pan in your arsenal. And, when starting your favorite stew, be sure the pot doesn’t go empty too long on your heat source -- this could result in it boiling dry, which leads to a damaged coating. Your cleanup will be short and sweet. 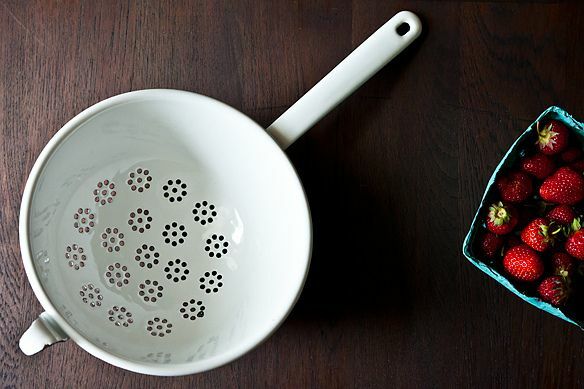 The glassy coating of enameled pots makes cleaning them a snap -- all you’ll need is hot, soapy water, a good rinse, and a thorough dry. It’s standard issue. Be wary of leaving your pot submerged in water, though, as this can cause water to become trapped inside; trapped water creates a perfect storm for rusting. And no one wants that. Enamel may seem tough as nails, and it almost is, but it’s not completely immune to chips. Be nice to your pots. Treat them like a part of your loving, kitchen family. Not dropping them goes without saying, but if by some stroke of evil you do get a chip, it’s not the end of the world. Simply make sure to dry the bare spot carefully each time you wash to stave off rust. To protect against scratching, lean toward wooden spoons and away from steel wool. And, last but not least, the tablecloth metaphor comes full circle: unfortunately, enamel can get mild stains from potent foods. (Beets, anyone?) If this happens, brush a quarter-sized amount of baking soda in your pan, and its original color will magically reappear. Have any tips for cooking with enamel that we didn’t mention? Let us know in the comments! O just received a kobe vintage made in Japan casserole dish. Can anyone tell me ANYTHING about it? Hello. I'm hoping someone can give me some info regarding enamel cookware. I purchased 2 sets from a neighbor, but I'm sure they're prob cheaply made. They look like casserole pans, in 3 sizes, but the seller had nvr used them and I don't see any care instructions on any of the pans. Typically, can I use these in the oven or no? One has a small chip and I noticed it looks like metal and/or iron bc there's silver metal with black as well. Thanks for any info you may have. Be sure the enamel pot is made of carbon steel or cast iron. Both materials can be worked on Induction cooker. i have purchased a few enamel pots and they don't last long. they chip. can anyone tell me what to look for to get a better quality enamel pot? I have several enamelled pots, but all have unfinished cast iron bottoms. 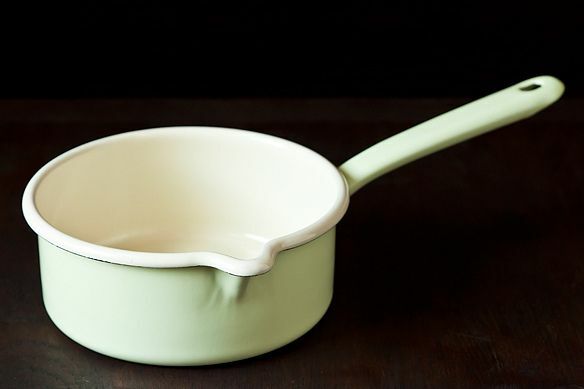 I just recently purchased my first Dansk casserole, which has an enamelled bottom. Is it safe for an electric cooktop? Will the coils cause scratches? I love how enamelled cookware looks but the enamelled you are referring to is often enamelled steel and the cheapest of cheap steel. This steel is actually an erratic and poor conductor of heat thus is really unreliable. Sometimes people refer to cast iron as enamelled, this is the preferred choice for continuity and good wear!